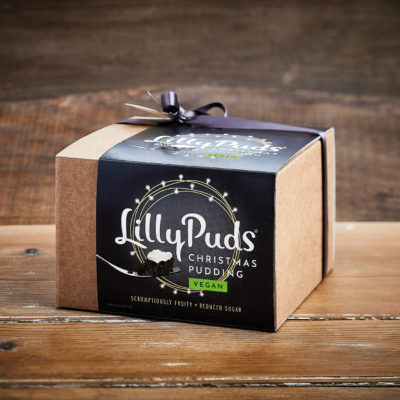 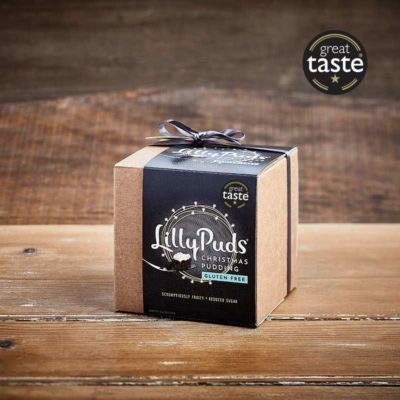 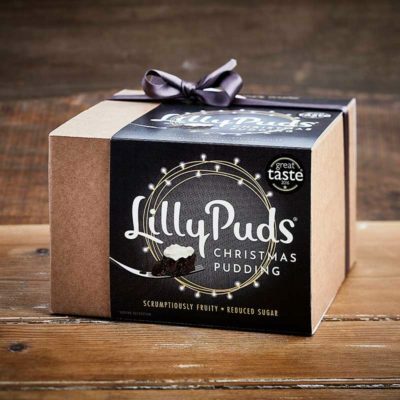 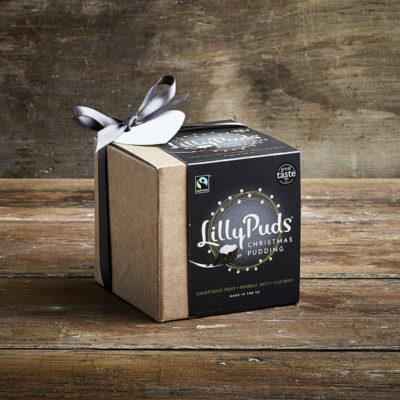 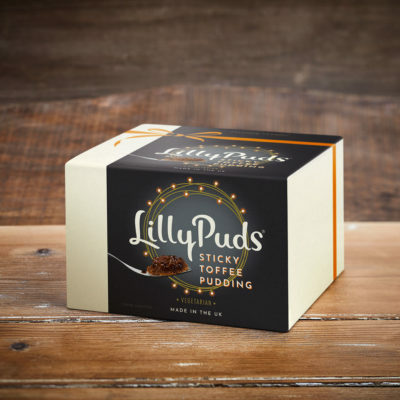 LillyPuds finest Plum Pudding laced with Damson Gin – finest vine fruits, prunes and walnuts blended with stout and brandy and a generous lacing of damson gin. 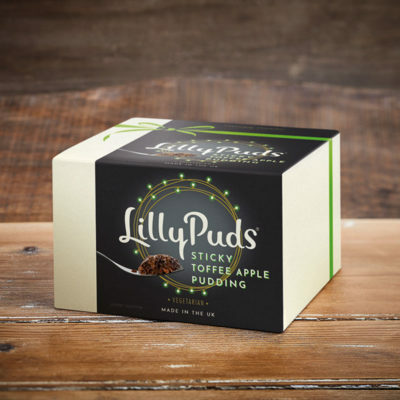 Vine Fruits (28%) (Sultanas, Raisins), Stout (9%) (BARLEY), Prunes (8%) (Prunes, Preservative: Potassium Sorbate), Apple (Apple, Antioxidant: Ascorbic Acid), Dark Muscovado Sugar (Sugar, Cane Molasses, Colour: Plain Caramel E150a), Non-hydrogenated Vegetable Suet (Responsibly Sourced Palm Oil, Sunflower Oil, WHEAT Flour (Calcium, Iron, Niacin, Thiamin)), Pasteurised Free Range Whole EGG, WALNUTS, Glace Cherries (Cherries, Glucose Fructose Syrup, Acidity Regulator: Citric Acid; Colour: Fruit and Vegetable Juice Concentrate), WHEAT Flour (Calcium, Iron, Niacin, Thiamin), Ground ALMONDS, Breadcrumbs (WHEAT Flour (Calcium, Iron, Niacin, Thiamin), Water, Yeast, Salt, Emulsifier: E471, E472; SOYA Flour, Preservative: E282; Rapeseed Oil, Flour Treatment Agent: E300), Brandy (3.0%), Damson Gin (2%), Sloe Gin (1.2%), Lemon Juice, Mixed Spice, Lemon Zest, Ground Cinnamon. 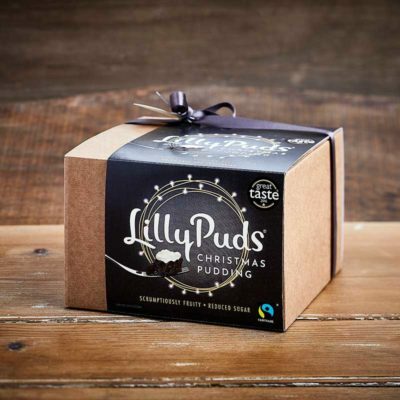 May also contain fragments of fruit stones.